by Chris Woodford. Last updated: May 5, 2018. Have you seen those extraordinary "maglev" (magnetic levitation) trains that float on air instead of rolling on wheels? They're entirely electric but, instead of using ordinary electric motors that spin around, they use a kind of "unwrapped" motor called a linear motor that causes them to move at high speed in a straight line. What are linear motors and how do they work? Let's take a closer look! 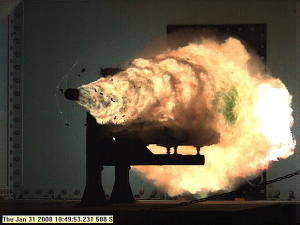 Photo: Linear motors have many peaceful uses, but they can also be used to accelerate projectiles in electromagnetic railguns like this one. The muzzle velocity here is a blistering 2520 meters per second (~9100 kph or 5640 mph)! Picture courtesy of US Navy. Artwork: Top: Normal motor: The rotor spins inside the stator and the whole motor is fixed in place. Bottom: A linear motor is like a normal electric motor that has been unwrapped and laid in a straight line. Now the rotor moves past the stator as it turns. Linear motors are electric induction motors that produce motion in a straight line rather than rotational motion. 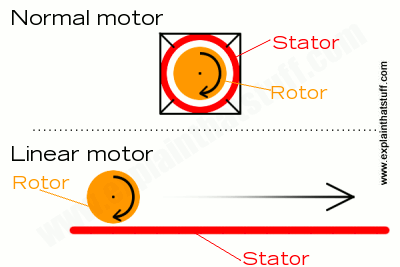 In a traditional electric motor, the rotor (rotating part) spins inside the stator (static part); in a linear motor, the stator is unwrapped and laid out flat and the "rotor" moves past it in a straight line. Linear motors often use superconducting magnets, which are cooled to low temperatures to reduce power consumption. The basic principle behind the linear motor was discovered in 1895, but practical devices were not developed until 1947. During the 1950s, British electrical engineer Eric Laithwaite (1921–1997) started to consider whether linear motors could be used in electric weaving machines. Laithwaite's research at Imperial College, London attracted international recognition in the 1960s following a speech to the Royal Institution entitled "Electrical Machines of the Future." Linear motors are now used in all sorts of machines that require linear (as opposed to rotational) motion, including overhead traveling cranes and beltless conveyors for moving sheet metal. They are probably best known as the source of motive power in the latest generation of high-speed "maglev" (magnetic levitation) trains, which promise safe travel at very high speeds but are expensive and incompatible with existing railroads. Most research on maglev trains has been carried out in Japan and Germany. 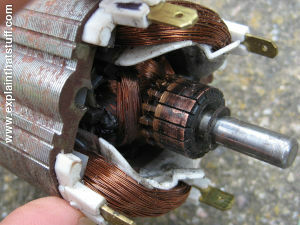 Photo: An ordinary electric motor is all about rotation: the rotor (the coils in the center) turns inside the stator (the outer magnetic case). In a traditional DC electric motor, a central core of tightly wrapped magnetic material (known as the rotor) spins at high speed between the fixed poles of a magnet (known as the stator) when an electric current is applied. In an AC induction motor, electromagnets positioned around the edge of the motor are used to generate a rotating magnetic field in the central space between them. This "induces" (produces) electric currents in a rotor, causing it to spin. In an electric car, DC or AC motors like these are used to drive gears and wheels and convert rotational motion into motion in a straight line. A linear motor is effectively an AC induction motor that has been cut open and unwrapped. The "stator" is laid out in the form of a track of flat coils made from aluminum or copper and is known as the "primary" of a linear motor. The "rotor" takes the form of a moving platform known as the "secondary." When the current is switched on, the secondary glides past the primary supported and propelled by a magnetic field. Linear motors have a number of advantages over ordinary motors. Most obviously, there are no moving parts to go wrong. As the platform rides above the track on a cushion of air, there is no loss of energy to friction or vibration (but because the air-gap is greater in a linear motor, more power is required and the efficiency is lower). The lack of an intermediate gearbox to convert rotational motion into straight-line motion saves energy. Finally, as both acceleration and braking are achieved through electromagnetism, linear motors are much quieter than ordinary motors. The main problem with linear motors has been the cost and difficulty of developing suitable electromagnets. Enormously powerful electromagnets are required to levitate (lift) and move something as big as a train, and these typically consume substantial amounts of electric power. Linear motors often now use superconducting magnets to solve this problem. If electromagnets are cooled to low temperatures using liquid helium or nitrogen their electrical resistance disappears almost entirely, which reduces power consumption considerably. This helpful effect, known as superconductivity, has been the subject of intense research since the mid 1980s and makes large-scale linear motors that much more viable. Everyone knows that the "like" poles of two magnets repel one another. With a little ingenuity, it is possible to make one magnet levitate (float) above another one using this repulsive force and (crucially) some additional external support. The idea of using electromagnetic levitation to support a moving vehicle was first proposed in 1912 by French engineer Emile Bachelet, but soon abandoned due to the enormous amount of electrical power required. 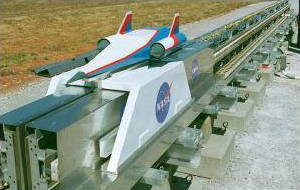 Photo: NASA tests a prototype Maglev railroad, 2001. Picture courtesy of NASA Marshall Space Flight Center (NASA-MSFC). In the 1960s, Eric Laithwaite's research into linear motors led to renewed interest in the idea of a magnetically levitated or "maglev" train. Around this time MIT scientist Henry Kolm proposed a "magnaplane" running on rails that could carry 20,000 people at 320 kph (200 mph). This prompted a US research program and led to a working prototype that was tested in Colorado in 1967. However, the US program ran into political difficulties and was shelved in 1975. The early 1990s brought an ambitious proposal to link Las Vegas, Los Angeles, San Diego, and San Fransisco with a maglev railroad, but that project has since run into more political problems. By contrast, maglev has been enthusiastically developed by Germany (using a system called Transrapid) and Japan (with a rival technology known as SCMaglev). German engineers first produced a working prototype in 1971 and developed the Transrapid system a year later. Strictly speaking, the Transrapid uses magnetic attraction rather than the magnetic repulsion normally associated with maglev: the copper magnets are fixed to a "skirt" that runs underneath, and is attracted up toward, the steel track. With considerable support from the German government, Transrapid has been progressively refined into a viable train that can reach speeds of up to 433 kph (271 mph). Decades of investment and development finally paid off in 2004, when Transrapid opened the world's first (and so far only) high-speed system, the Shanghai Maglev Train (SMT), in China. Although it currently operates on only a short section of track (a mere 31km or 19 miles long), there have been several plans to extend it, though they have repeatedly been shelved. The Japanese have been even bolder and have long hoped to develop a high-speed maglev train that can travel the 320 miles (515 km) from Tokyo to Osaka in just one hour. Unlike the German Transrapid, the Japanese system is genuine maglev: the train floats on the repulsive force between the copper or aluminum coils in the track and a series of helium-cooled, niobium-titanium superconducting magnets in the cars (hence the name SCMaglev, where SC stands for "superconducting"). The Japanese prototype ML-500 train achieved a train speed record of 513 kph (321 mph) in 1979. A later prototype known as the MLU002 was destroyed by fire in 1991; a firefighter apparently found his ax pulled from his hand by one of the superconducting magnets as he approached the burning train! Despite this setback, development continued. By 2015, SCMaglev had been perfected to the point where it clocked up a record-breaking speed of 603 kph (375 mph)—making it the fastest rail vehicle in the world. Even though the Japanese government has declared SCMaglev ready for commercial operation, unlike Transrapid, it's yet to be deployed on any working railway anywhere in the world. Hopefully, that will change with the opening of the Chuo Shinkansen SCMaglev rail line between Tokyo and Nagoya (and eventually Osaka), currently under construction and expected to begin operation in 2027. Although maglev technology continues to generate a great deal of interest around the world, it is still more expensive mile-for-mile than building a traditional high-speed railroad. For this reason (and also because it's completely incompatible with existing railroads), it's unlikely to be widely used for some years. Tech writers and children's science books have been flagging up maglev as a promising technology of the future since at least the 1970s; on past form at least, it's perfectly possible that maglev will always be just over the horizon—the train that never actually arrives. Even though the Japanese are now finally constructing a major maglev line, it remains to be seen whether they can persuade other countries to buy into the technology. Artwork: Trains powered by linear motors have been touted as a promising technology for decades. Here's a system patented in the 1960s by Millard Smith and Marion Roberts, which they claimed "is capable of traveling at speeds in excess of 100 miles per hour silently and with minimal vibration in a manner superior to any commercial rail vehicle now operating." Left: One version of their design uses two relatively conventional rails (red) with a third, magnetic power rail (green) added between them. Right: How it works: the train (blue, 10) rides on shoes (orange, 13), held a few millimeters (a fraction of an inch) above the outer rails of the track (red, 12) by a cushion of compressed air (15). The third rail is a linear motor using wire-wound electromagnets (21) mounted to the underside of the train to propel it past the static rail (11), which is made from copper or aluminum. 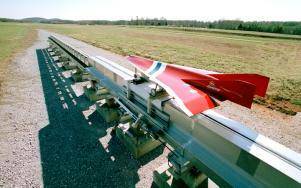 Although this system uses a linear motor, it's not actually a maglev because the train isn't levitated by magnetism. From US Patent#3,233,559: Transportation means by Marion L. Roberts and Millard F. Smith, courtesy of US Patent and Trademark Office. Rising Force: The Magic of Magnetic Levitation and Driving Force: The Natural Magic of Magnets, by James Livingston. Harvard University Press, 2011/1996. Linear Synchronous Motors: Transportation and Automation Systems by Jacek Gieras et al. CRC Press, 2011. A History of Linear Electric Motors by Eric Laithwaite. Macmillan, 1987. Supertrains: Solutions to America's Transportation Gridlock by Joseph Vranich. St Martin's, 1991. Maglev Elevators Will Take You Up, Down, and Sideways by 2016 by Evan Ackerman. IEEE Spectrum, December 2, 2014. Could linear motors revolutionize the design of elevators? 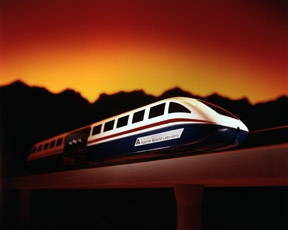 Transrapid International's Maglev by Philip Ross. IEEE Spectrum, June 1, 2012. Exploring Transrapid's progress on the Shanghai maglev (the world's only high-speed maglev railway). The Magnetic Attraction of Trains, BBC News, 9 November 1999. A basic overview of maglev, including a brief look at the ill-fated Birmingham Airport maglev and the role of Eric Laithwaite. Gordon T. Danby, Who Helped Invent Magnetic-Levitation Trains, Dies at 86 by Henry Fountain. The New York Times, August 11, 2016. Obituary of one of maglev's pioneers. Professor Eric Laithwaite demonstrates the magnetic river: A very brief video demonstration of Laithwaite's "magnetic river" concept, in which a moving object is held on a steady path and propelled by a magnetic field. US Patent#1,020,942: Levitating Transmitting Apparatus: Emile Bachelet's original magnetic levitation patent from March 19, 1912. 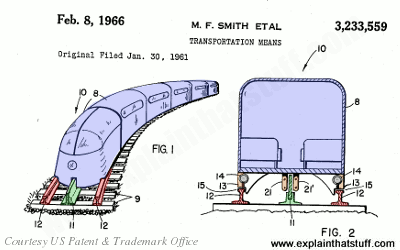 US Patent#3,233,559: Transportation means by Marion L. Roberts and Millard F. Smith, February 8, 1966. An early proposal for a railroad driven by linear motors and supported by a cushion of air. US Patent#3,470,828: Electromagnetic inductive suspension and stabilization system for a ground vehicle by James R Powell Jr, Gordon T Danby, October 7, 1969. The technology of "floating", magnetically supported maglev trains is explained here by two of its key advocates. US Patent#4,040,983: Electromagnetic levitation: A more developed linear motor patent by Alan Attwood and Eric Laithwaite from September 20, 1977. US Patent#6,044,770: Integrated high speed MAGLEV system by Kent R. Davey, Tony J. Morris. Park Square Technology, Ltd. April 4, 2000. Beginning with a discussion of various earlier maglev ideas, this patent goes on to describe a cutting-edge maglev railroad system in some detail.